Tell us a little about Juan Lizcano Design and the team? Juan Lizcano is an Industrial Designer from Colombia who lives in Melbourne. 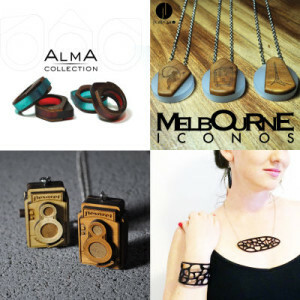 Juan has been working in the Australian design industry with laser and engraving machines for nearly 10 years. 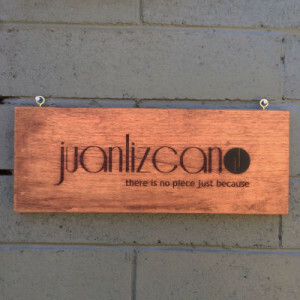 In July 2014, Juan Lizcano Design was founded from Juan’s love of design. Juan’s small studio and workshop is constantly buzzing with new ideas and designs for both business and home. His background in design, together with his eclectic mix of Colombian and Melbourne urban rhythms, mean that his products are striking, stylish and functional. Juan’s products range from home wares, jewellery, party products, business signage, custom trophies, industrial engraving and much more! The team is currently made up of 2 people, Juan Lizcano and his wife Sarah who takes care of marketing and sales of the business. 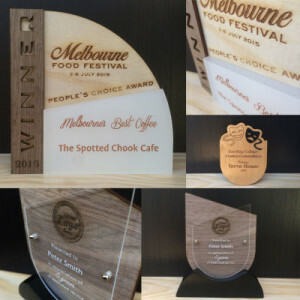 We like to eat amazing foods from all over the world as well as enjoying the incredible design and festival culture that Melbourne has to offer. Juan is a mad soccer supporter and loves playing sports. I began my work with lasers and engraving nearly 10 years ago in a company that specializes in laser engrave trophies, awards, signage and name badges. I have always been able to see the endless potential a Laser machine can create. I enjoy the variety of possibilities of materials that can be laser cut and engraved to craft unique pieces for any type of industry. We currently work with a Trotec Speedy 300 80 watt, servicing different industries such Schools, Sport Clubs, Real Estates, Banks, Events (Birthday Parties, Weddings, Corporate Events), Local Markets/Stores, Councils and any industry looking for any design and/or laser product. We are open to any idea a client may bring to the table. Our products are beautiful, durable and of very high quality. Our design range includes home wares, jewellery, party products, business signage, custom trophies, awards, industrial engraving, labels, tags, business cards, office products and much more! Juan also specializes in custom designs so you can have your very own idea brought to life. What has been your favourite job and why (please supply an image)? Every job is unique and special in its own right. 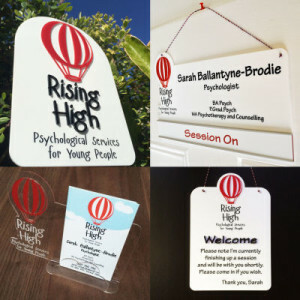 We recall a recent job that was completed for a Psychological Private Clinic that included an Outdoor Business sign, Door Session slider-sign, Welcome sign and custom-design Business Cardholder. This business package was produced with different techniques, processes and volumetric (3D) pieces. 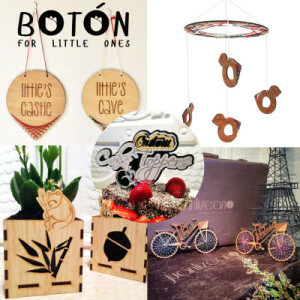 Customised products/designs, and anything that is going to be a unique stylish piece of art such as signs, awards to home-decoration, jewellery or products for special events. The size of the business or machine does not determine the size or quality of a product. It is the designer behind the machine who has the skills to design, source and create a beautiful product the client will be very proud of.